Article 8 of the Directive describes the procedures whereby the manufacturer or his authorised representative established within the EU ensures and declares that the product complies with Directive 94/9/EC. For assemblies further guidance is given in chapter 3.7.5.
ii) Unit verification (Module G). which are intended to be used in the technical harmonisation directives (OJ L 220, 30.8.1993, p. 23). 44 See Annex IV to the Directive. 45 See Annex V to the Directive. 46 See Annex IX to the Directive. 47 See Annex VI to the Directive. 48 See Annex VII to the Directive. 49 See paragraph 3 of the Annex relating to the internal control of production. 50 Conditions of storage of documents shall be agreed between the Notified Body and its client. Safety, controlling and regulating devices have to comply with the requirements of Annex II, clause 1, especially clause 1.5. The formal conformity assessment procedures of Article 8 apply and the safety devices are assessed according to the equipment group and category of the system consisting of the safety device and the equipment under control. In some cases it is necessary to perform the assessment for the combination (e.g. inverter fed motors), but generally the assessment for a group of equipment and the appropriate safety devices can be done separately (e.g. type "e" motor). Example: A type "e" motor of Category 2 is controlled by an overload protection device located outside the explosive atmosphere. The conformity assessment procedure of equipment group II and Category 2 is applied for the safety device. EC Type Examination (Annex III): Provides a specimen of the envisaged production to a Notified Body which undertakes the necessary evaluation to determine that the "type" meets the essential requirements of Directive 94/9/EC and issues an EC Type Examination Certificate. Production Quality Assurance (Annex IV): Operates a quality system approved by a Notified Body for production, final equipment inspection and testing and is subject to on-going surveillance. Product verification (Annex V): Examination and tests by a Notified Body of every product to check the conformity of the equipment, protective system or device with the requirements of Directive 94/9/EC and draw up a certificate of conformity. Conformity to type (Annex VI): Tests carried out by a manufacturer on each piece of equipment manufactured to check the explosion protection aspects of the design. Carried out under the responsibility of a Notified Body. Product Quality Assurance (Annex VII): A quality system approved by a Notified Body for the final inspection and testing of equipment subject to on-going surveillance. Internal Control of Production (Annex VIII): Product and quality system assessment procedure carried out by the manufacturer and retention of documentation. 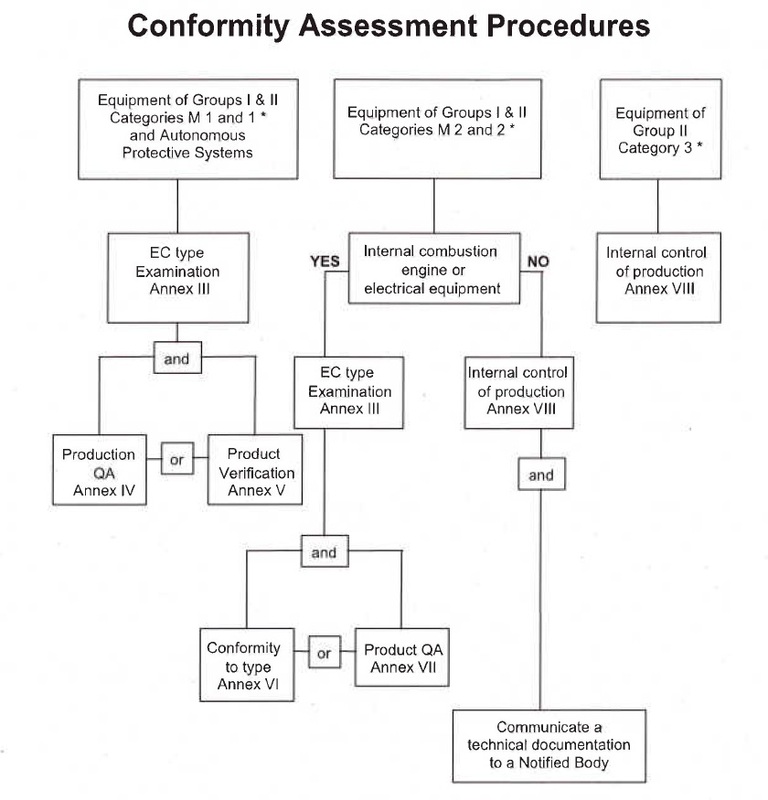 Unit verification (Annex IX): Notified Body examines individual equipment or protective system and carry out tests as defined in the harmonised standards, if they exist, or otherwise in European, international or national standards or conduct equivalent tests to ensure conformity with the relevant requirements of Directive 94/9/EC and draw up a certificate of conformity. Product and quality system assessment procedure carried out by the manufacturer and retention of documentation by a Notified Body. Note: According to Article 8.4 for all equipment and protective systems of all groups and categories conformity to 1.2.7 of Annex II of the Directive (protection against other hazards) can be fulfilled by following the procedure of internal control of production (Annex VIII). Which conformity assessment procedures have to be performed in the case of different categories within one product, or mixes of equipment and protective systems according to Article 1.3 b ? If a product is made of parts which are assigned to different conformity assessment procedures it will be up to the manufacturer to decide how these parts and the whole product shall be placed on the market. The manufacturer can decide to realise the appropriate conformity assessment procedures for each part or for the whole product, even if he decides to place the product as an entity on the market. In the case of separate conformity assessment procedures for each part of the assembled equipment (called assembly in the Guidelines to Directive 94/9/EC), the manufacturer may presume conformity of these pieces of equipment and may restrict his own risk assessment of the assembly to those additional ignition and other hazards, which become relevant because of the final combination. If additional hazards are identified a further conformity assessment of the assembly regarding these additional risks is necessary. If the manufacturer explicitly asks a Notified Body to assess the entire product, then that conformity assessment procedure has to be applied, which covers the highest requirements. The Notified Body shall include into the EC-Type examination (if relevant) all aspects of the product. Existing conformity declarations of the manufacturer for parts of the product should be given due consideration. The Notified Body should inform the manufacturer about the possibilities of separate conformity assessment procedures for each part of the assembly as pointed out by the Guidelines to Directive 94/9/EC. Any certificate issued by the Notified Body should make clear which aspects of the product have been assessed by the NB, and which have been assessed by the manufacturer alone. (a) The pump is sucking the petrol vapour-air mixture from the atmosphere and conveying it in pipe­work attributed to Zone 0. Accordingly it is connected at its inlet and outlet to a potentially explosive atmosphere classified as Zone 0. The pump itself is placed in a Zone 1 environment. With regard to the inlet and outlet connection the pump then has to comply with the requirements for Category 1 equipment. The corresponding EC-Type examination (equipment) has to be carried out by a Notified Body. With regard to the remaining (outer) body and integrated parts of the pump the Notified Body includes the necessary Category 2 assessment into the certification, even if there are only non-electrical ignition sources to be considered. Both categories shall be indicated in the EC-Type Examination Certificate, making clear which aspects of the product have been assessed by the Notified Body, and which have been assessed by the manufacturer alone, and in the marking. For those Category 2 parts of the pump, which show only non-electrical ignition sources and which are placed separately on the market, and for which the technical documentation has been communicated to a Notified Body, an EC declaration of conformity (for equipment) or a written attestation of conformity (for components) of the manufacturer are sufficient. (b) Often the pump is expected to prevent the passage of a deflagration flame from the inlet to the outlet connection, as typical vapour recovery pumps contain flame arresters in the inlet and outlet pipe. In this case the pump simultaneously may qualify as a protective system (in-line deflagration arrester). A Notified Body – after having carried out a corresponding assessment of the flame arresting capability – may then issue a separate EC-Type Examination Certificate for the pump as a protective system. In case that both aspects (equipment and protective system) have been assessed by the same Notified Body, only one EC-Type Examination Certificate may be issued. All equipment and protective systems referred to in Article 1 (1) including components and the devices referred to in Article 1 (2) are covered by the provisions of Article 8 (5). is restricted to the territory of the Member State concerned. This provision may be applied in safety relevant cases, in which the products in question are needed urgently and there is insufficient time to undergo the complete Conformity Assessment Procedures (or to complete these procedures). The intention is to give Member States (in the interest of health and safety) the possibility to allow the placing on the market and putting into service innovative products without delay. Even in such cases the essential requirements of the Directive must be fulfilled. With regard to the restrictive application conditions it has to be emphasised that the use of this clause has to remain exceptional and must not become a normal procedure. In the interests of transparency and to assist administrative co-operation Member States are encouraged to provide the competent Commission services with details of any use of Article 8(5).